SAN GERMAN, Puerto Rico (CNS) — Although environmental restrictions have put a damp on Catholic Candlemas celebrations in many countries, some devotees in rural Puerto Rico still hold traditional ceremonies centered on bonfires. That is the case of 36-year-old Jose Padilla, a former seminarian who has been “a Marian devotee since age 6.” He runs a little family shrine tucked high up in the hills south of San German, a colonial city in southwestern Puerto Rico. For the past 21 years, Candlemas has been celebrated here exactly in the same centuries-old fashion as part of a popular Marian devotion. 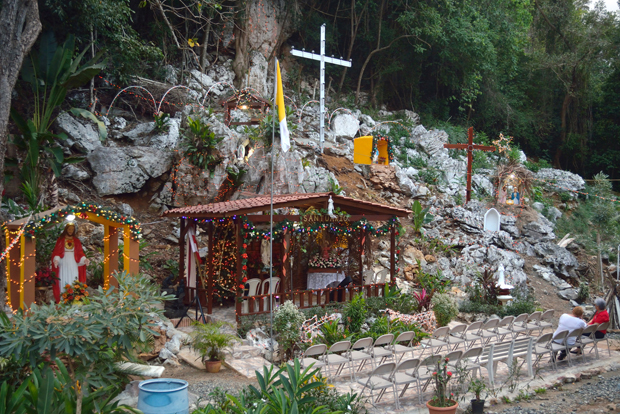 The site is set in his family backyard, against a steep karst mountainside dotted with porous white boulders on which small niches have been built to house a variety of saints’ statutes. The focal point of the layout features an elevated concrete platform with overhead steel cover and a statue of Mary on the back wall. A bright yellow, Spanish mission-style outer wall, gate and bell housing, rounds the perimeter of the site. The shrine hosts a rosary every Sunday evening, with attendance peaking at 200. This year’s “Candelaria” (fiery) feast — as the feast of the Presentation of the Lord is known in Spanish-speaking countries — at the shrine was threatened by drizzle. But after the bell was rung, about two dozen faithful started the prayer. Attendees took turns leading the recitation of each rosary mystery. After the rosary, everyone gathered around a conical pile of wooden pieces. “When the days were completed for their purification according to the law of Moses, they took him (Jesus) up to Jerusalem to present him to the Lord,” read Padilla from the Bible before explaining the traditional use of fire for the celebration. The connection between fire and the Presentation comes from biblical Simeon who, upon seeing baby Jesus at the temple, referred to him as “a light for revelation to the Gentiles and for glory to your people Israel,” from Chapter 2 of St. Luke’s Gospel. Over the centuries, the feast of the light of Christ has become a Feb. 2 evening celebration with candles shining in the dark of night. The date coincides with the end of the 40 days of Mary’s purification after giving birth — and when she was required by Jewish law to present Jesus at the temple for consecration. Latin America’s Candelaria tradition comes via the Canary Islands, where legend says the first apparition of Our Lady of Candelaria was reported around 1400, although no exact date has been established. Supposedly, a statue of Mary holding a baby and a candle was found at a beach there around that time. In Puerto Rico, bonfires were the accustomed norm for urban and rural Candlemas celebrations. Many local Catholics still consider the feast a logical end to the Christmas season. She added that Candlemas at the shrine takes attendees back in time to the original tradition.